Skylanders has had a bit of an odd history. Initially, it launched under the auspices of the Spyro name, and made a very small splash in the market -- so small, that barely anyone knew what it was. Fast forward to six months later, and it was the hottest toy on the shelves, so much so that many retailers couldn't even keep it stocked consistently. 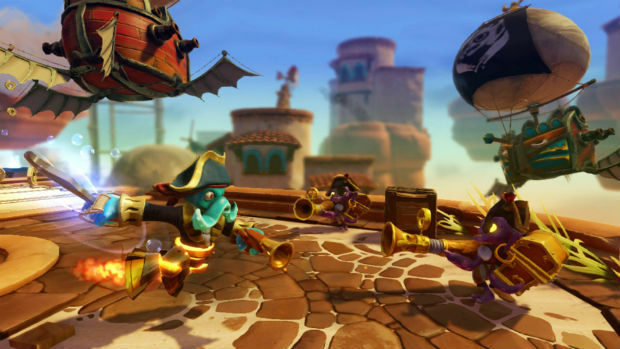 A sequel was greenlit, and the rest was history, as Activision raked in over a billion dollars from the Skylanders franchise alone. It's a massive success, and now, the third iteration is attempting to claim the throne once again, fighting off the juggernaut that is Disney Infinity. Let's just say it's going to be a very interesting holiday season for videogame toys. 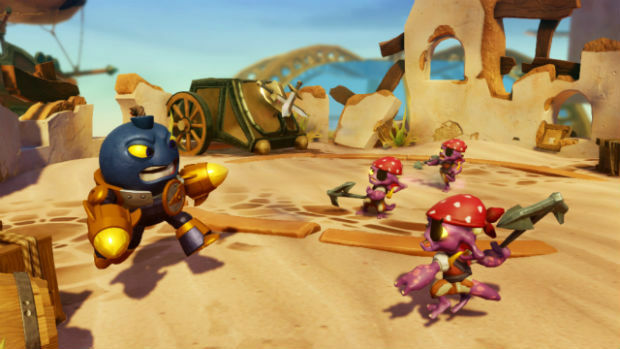 Once again, Skylanders utilizes the "toy and game" concept, offering up a host of characters to use in-game so long as you own the physical figure. Since Swap Force uses new technology that incorporates figures with multiple pieces, you must buy a new Starter Kit to get the new "Portal of Power" base to beam the toys into the game. Yes it's a bummer, but once you dive into Swap Force you'll quickly forgive the inconvenience. For starters, the series received a huge visual upgrade that puts it on par with many animated theatrical films. While the jump from Spyro's Adventure to Giants wasn't massive enough to turn any heads, Swap Force sports some very high production values in multiple areas of the game, even on a console like the Xbox 360. Not only have old characters been overhauled to bring some more nuance to their animations, but the new characters look fantastic: especially the "Swap Force" members, which I'll get to momentarily. 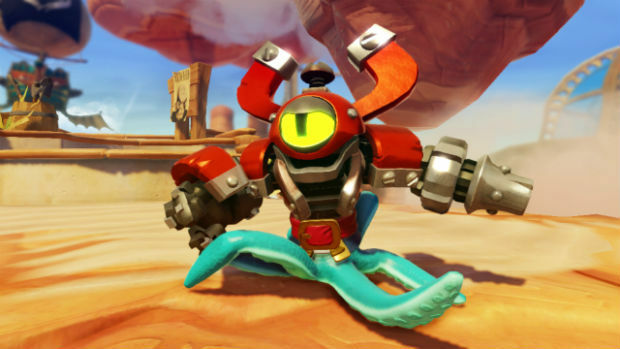 Skylanders also has a stellar voice cast to support said visuals, and pretty much everyone is at the top of their game yet again in Swap Force. Patrick Warburton effortlessly nails the goofy Flynn, and Steve Blum as one half of the anthropomorphic "Hip[po]Bros" is another welcome addition. Famous or not, the rest of the cast is stacked with delightful performances, like a talkative fish who does his best rendition of Steve Buscemi's "total silence" routine from Fargo. I really think at this point after seeing Swap Force in action, Activision could just hire Patrick Warburton and make a pretty entertaining kids show. So what's actually new? Quite a bit, actually. In Giants, the main gimmick involved having to use special "Giant" toys that were larger than most to barge through special barriers. It was highly inoffensive considering that the Starter Pack came with one, and that one Giant was all you really needed to access every bit of content. In Swap Force, many new toys feature detachable legs and upper bodies so that you can mix and match and form your own combinations. I ended up loving this part far more than I thought I would, for multiple reasons. Not only do the new Swap Force toys and in-game models have a ton of detail (Wash Buckler's squid legs are a highlight), but it also allows an unprecedented amount of customization as you search for your favorite playstyle. Immediately, I started experimenting with squid tentacles, snake coils, and chicken feet as I searched for my ideal Skylander, but had a blast the entire time -- especially since each part has its own upgrade path and unique abilities that carry over when you swap them. The key is that the Swap Force brigade isn't solely built around the "switch" gimmick, as a major emphasis has been put on their bottom halves -- which are used to drastically switch up your means of travel. Every Swap Force toy has a new means of getting around, whether that's rocket boots, teleportation, a whirlwind, or wheels -- and they're all a ton of fun. My favorite new character ended up being "Magna Zone," which is the combination of the robotic enforcer of Magna Charge and the fiery rocket legs of Blast Zone. Depending on what leg parts you use new mini-games open up that use completely unique mechanics, like races, flight challenges, Donkey Kong Arcade-esque climbers, 2D platforming sections, and sidescrolling beat-'em-ups. I was pretty surprised at the insane amount of variety the developers packed in, and thankfully, none of it gets stale or overstays its welcome. The core game is just as fun as ever, as it's really easy to just jump in and start blasting or hacking away. Every character still has three base abilities, but nearly all of them have some sort of variation that vastly changes how it operates, like the ability to charge them up into a new attack by holding a button. On higher difficulties Swap Force can put up a decent fight, which is great news for those of you who don't want to just effortlessly make your way through a bunch of playgrounds. Mechanically, quite a bit is new as well in Swap Force, mostly because you finally jump! It sounds absolutely ridiculous, but the first two games did not feature jumping -- instead, players had to use "jump pads" to climb vertically. But given the new-found freedom to leap about, secrets are now more cleverly hidden, new puzzle opportunities arise, and the game just feels better in general as a result. Besides bounding, a concerted effort has been made to make co-op play more fun, which is great news for those of you with kids, or a spouse who enjoys the simplicity of the series. Loot and food are now shared (preventing one player from stealing everything), allowing both players to enjoy the game equally. But multiplayer extends beyond that, as now, everything you do -- even if it's a solo area -- allows the other player to interact in some way. Instead of the one-player puzzle boxes from Giants, co-op partners now have to solve a special multiplayer brain teaser. If there is an area that only accommodates one player, the other is given a power-up or special attack to unleash at their leisure to assist. 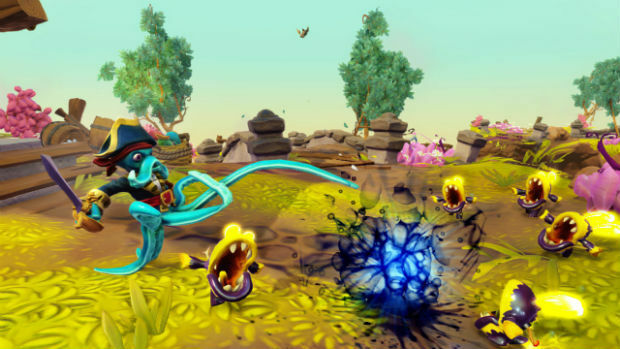 The enhanced co-op is going to come in handy when you're tackling the most amount of content yet in a Skylanders game. In addition to the fairly hefty campaign, there are more collectibles than ever to find, tons of secrets, and a large amount of bonus missions. The Arena also returns, and it has a staggering amount of gametypes. Thankfully there's a bit of variety this time around, that ranges from PVP, to co-op, to a mix of the two (which is my personal favorite). Like Giants, you earn money and experience in the arena, encouraging everyone to at least try it. You can also raise your "Portal Master Rank" in addition to your Skylanders' actual levels to unlock more items, so you're in for a long ride if you want to get everything -- and it doesn't feel like a grind, because it's fun throughout. Swap Force also benefits from the fact that every past toy is compatible with the third generation. So at this point, you can pick up the previous two games on the cheap, and use pretty much every toy in the current game somewhere down the line. As always, the toy's abilities, appearance, and statistics are still kept in the figure itself -- so you can bring your collection to a friend's house, or even switch console generations without any issues strictly in terms of your character progress. 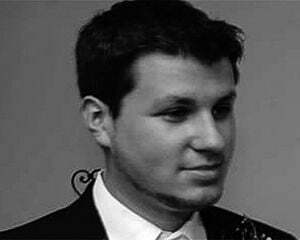 If you were thinking that this was going to be an Activision cash grab, think again. 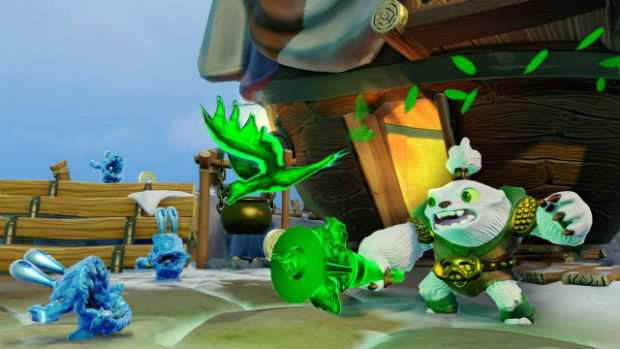 So much heart and soul is consistently poured into the Skylanders franchise time and time again, and Swap Force is no exception. In fact, it's the best one yet.